Good Gen X movie party rental - if you still do those. "Cigs" has just the right air about it to make it ideal for home viewing, and it's much more enjoyable than all those other critics say it is. At first I was highly dubious about "200 Cigarettes." From what I'd seen before hand, it looked like mediocre script at which the producers threw a lot of hip actors hoping the cast would hoist it up to their level. And after all, it's a soundtrack-driven product of MTV Films -- not exactly a proud pedigree. I'm delighted to report I was very much mistaken. An ensemble comedy with a cast of a dozen breakout stars all traipsing through Manhattan misadventures on their separate ways to the same party on New Year's Eve 1981, "Cigarettes" has a capricious hum about it and the same non-stop brand of comedic timing (although a different brand of comedy) that was honed to perfection in "There's Something About Mary." Although it's an unpolished effort from movie newbies Shana Larsen (writer) and Risa Bramon Garcia (director), there are no wasted scenes, no busted jokes, and a number of comedic crescendos that will send you roaring over the back of your chair. This is funny stuff. 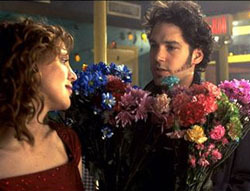 East Village misery-addict Paul Rudd ("Clueless") and his promiscuous, platonic pal Courtney Love battle long-buried romantic predilections. Katie Hudson -- the 19-year-old daughter of Goldie Hawn who has inherited her mother's looks and her pratfall proficiency -- loses her virginity to flabbergasted commitment-phobe Jay Mohr ("Mafia!"). Gaudily over-dressed Christina Ricci sports an gloriously grating Long Island accent as she and Gaby Hoffman get hopelessly lost in Alphabet City after misplacing the party address. Madonna wannabe Angela Featherstone (following "The Wedding Singer" with another '80s flashback) and petulant pal Nicole Parker ("Boogie Nights") comb the bars in a superstitious frenzy, convinced if they don't wake up New Year's Day in bed with cute guys they'll spend the whole year alone. One of their candidates is a surprisingly self-mocking Ben Affleck, playing a klutzy bartender and inept Casanova. Meanwhile, the neurotic hostess of the party (Martha Plimpton) is in hysterics because midnight is rapidly advancing and her only guests so far have been one fair-weather friend who abandons her for peppier pastures and an ex-boyfriend in the middle of a sexual anxiety crisis. And I haven't even mentioned the two best performances in the picture: Janeane Garofalo as a bitter (naturally) budding rock star and Dave Chappelle, who plays the super-smooth, jive-talking cabbie that ties all the stories together. Of course, the inevitable culmination of all this will be happy endings and a successful party. But "200 Cigarettes" is not entirely predictable along the way and, unlike "The Wedding Singer," it doesn't depend on '80s shtick for its laughs. Sure there's neon cowl necks sweaters, florescent fishnets, Aqua Net hair helmets, guys in eyeliner, chunky chokers, two-pound earrings and other New Wave fashion atrocities. There's also the occasional but subtle pop culture icon (a shouldered boom box, a ring watch, Elvis Costello in a cameo). But all of this is incidental. The comedy comes first, the self-aware goofs on Generation X, The Early Years come second, and that's why it will be just as funny in 2009 as it is in 1999. And with this cast of edge-of-super-stardom players, "200 Cigs" will definitely be remembered in 2009, like "American Graffiti," "Diner" and "Fast Times at Ridgemont High" are remembered now for launching or accelerating humongous careers. Ben Affleck and Christina Ricci have already become marquee-power stars in the last 12 months, and Love, Garofalo, Hudson, Mohr, Rudd Chappelle and Plimpton (who already has a lucrative indie career) are hot on their heels.